One of New Zealand’s most remarkable set of farm buildings, dating back to the 1850s, sits atop a ridge in the Wainuioru district. 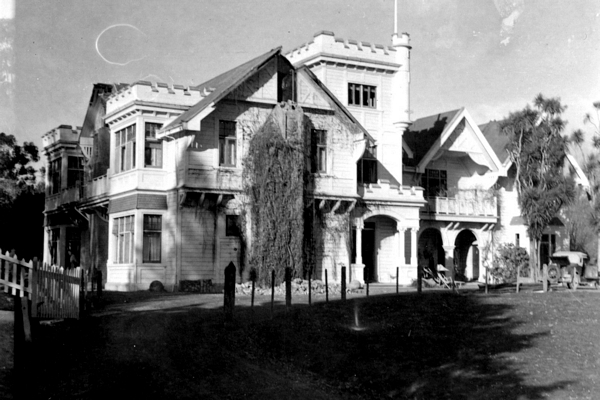 The homestead, painted glistening white and designed in the Scottish baronial manner, sits at the heart of a unique set of buildings that together illustrate the lifestyle of the extensive sheep and cattle farms that once dominated the Wairarapa countryside. The property was first settled in 1856, when four sons of William and Mary Beetham, and a short-lived partner called Jack Hutton, drove 500 sheep into the Wainuioru Valley to take up their 4,000 hectare leasehold property. They constructed their first buildings – a whare, a storehouse and a woolshed – and set about breaking in their run. Hutton left the station early, his place being taken in a financial sense by the Beetham brothers’ brother-in-law Thomas Coldham Williams, the son of the missionary Henry Williams. Although he never lived at Brancepeth, his input allowed the brothers to acquire the freehold on their property and to undertake improvements. They were also able to counter the threats that wild dogs, pigs and rabbits. Brancepeth was at its peak in 1900 – the largest sheep station in Wairarapa, it was 24,000 hectares (59,000 acres) and employed hundreds of men. The main homestead and its surrounding buildings comprised a small village in effect. Aware of the threat of Government compulsory acquisition, the Williams and Beetham partnership was dissolved in the early 1900s, the central base being left to Hugh Beetham. He employed Wellington architect Joshua Charlesworth to build a new homestead, partially based on some earlier buildings. The result is the statuesque Brancepeth homestead, “a visible manifestation of the Station’s success”. Government purchase reduced the size in 1914, and following World War Two, for soldiers’ rehabilitation blocks, and the homestead block, still in Beetham family hands, now stands at 520 hectares (1285 acres).